Dark chocolate 62% cocoa, with almonds. Whittaker's premium quality chocolate is crafted to traditional recipe using the finest West African coca beans and creamy whole milk. 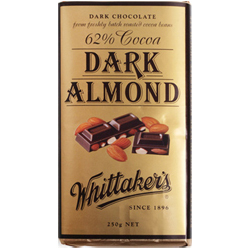 The beans are roasted to perfection to give the unique European style and flavour that has made Whittaker's a famous New Zealand brand since 1896. Dark chocolate (75%) (Cocoa Mass, Cocoa Butter, Sugar, Emulsifier (Soy Lecithin), Vanilla Flavour), Roasted Almonds (25%).